To provide flexibility, reliability and scalability, the components which make up Business Objects Enterprise, can be installed on one machine, or distributed across multiple machines (using clusters & Load balancing). Client tier is made up of the applications that enable users to administer, publish and view reports and other objects. They have divided their client applications into two parts. 1. 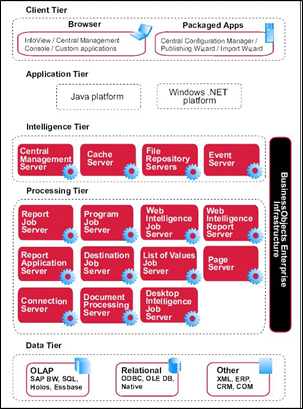 Application Server: It acts as the gateway between the web server and the rest of the components in Business Objects Enterprise. It is responsible for processing requests from your browser. 2. Web Component Adapter (WCA): It processes ASP.NET and Java server pages files. It also supports BO applications such as CMC and Crystal report viewers. It will take login credentials from the login page and hand it over to Central Management Console (CMC). This layer consists of the following servers. 2. Cache Server: This server is responsible for handling all report viewing requests. It stores the report pages in a cache, by doing so; the BOE avoids accessing the database each and every time a report is requested. It is like all the recently opened report pages are managed by this server. Input File Repository Server (IFRS): This server consists of all the users login credentials, folders, groups, access privileges, saved and exported reports. Output File Repository Server (OFRS): This server consists of all the schedules instances of the reports. 4. Event Server: This server manages all the scheduled File-based events. It monitors the directory that we specify when setting up a file based event. When the appropriate file appears in the monitored directory, the Event server triggers the file based event. Processing Tier consists of the following servers which are as follows. WEBI Report Server: To create new WEBI reports, open, modify existing WEBI reports. It processes scheduled WEBI documents and generates new instances of the document, which it stores on the OFRS. WEBI Job Server: To schedule WEBI reports. It processes scheduling requests it receives from the CMS for the WEBI documents. DESKI Report Server: To create new DESKI reports, open, modify existing DESKI reports. DESKI Job Server: To schedule DESKI reports. It processes scheduling requests it receives from CMS for DESKI documents. It generates the instance for DESKI document. Report Application Server: It is one of the server which is useful to create new Crystal reports, open, modify existing Crystal reports. Report Job Server: It is one of the servers which is used to schedule Crystal reports. The Report Job Server updates the CMS with the job status. It generates report instances. Page Server: It is primarily responsible to page requests by processing reports and generating EPF. This server’s job is to compress WEBI, DESKI and Crystal reports into Encapsulation Page Format (EPF). Document Processing Server: To convert WEBI, DESKI and Crystal reports into required formats like PDF, WORD and EXCEL. Controlling Server: To manage connection between Business Objects and all other target Data Sources. Destination Job Server: To deliver scheduled copies to the end user destination location. It processes the requests that it receives from the CMS and sends the requested instances to the specified destination. List of Values (LOV) Server: This server manages all the LOV’s during the Run Time. Program Job Server: This server’s job is to execute external programs into BO.